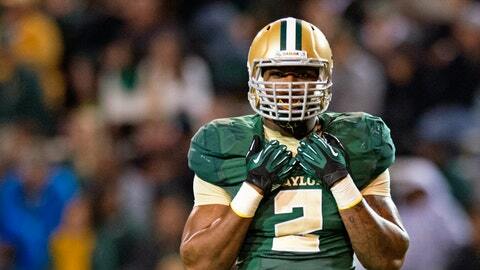 Shawn Oakman and Baylor beat Texas Saturday and will go to the Fiesta Bowl. It might have looked like one small step for Shawn Oakman. However, it turned into one bad leap for Oakman and Baylor during the fourth quarter of the "Battle of the Big 12 championship" between the Bears and Texas on FOX. Here was the situation: Texas had the ball, fourth-and-15 from the Baylor 15-yard line with 14:51 left in the game. Baylor led 20-3. Texas’ Anthony Fera attempted a 33-yard field goal and the kick was good. However, Oakman was called for a personal foul after he was behind the line, took one step forward and then leaped up to try and block the kick. Texas was given a first down at the 8-yard line and scored a touchdown four plays later. So it turned into a four-point leap. Rule 9, Section 1, Article 11 states that no defensive player who runs forward from beyond the neutral zone and leaps from beyond the neutral zone in an attempt to block a field goal or try may land on players. And that’s exactly what Oakman did in this case. Texas coach Mack Brown decided to take points off the board, which sometimes can be a questionable decision to give up the three points and go for seven. But I do think in the situation that the Longhorns were in at the time of the game that it was the right decision. You would think that players would know this rule, especially on special teams. The key is: You can’t run forward and then leap and land on players, whether that’s an opponent or even your teammate.